Community informatics studio projects have regularly focused on design of programs and space in response to needs and opportunities brought to the class by community partners. For summer, 2016, we’ll zoom out a bit more to explore various dimensions of adapting and implementing a library trend to a new context, and how we can develop our capacity to lead such an initiative. This class will be open to both on-campus and online students, and is also available as a continuing education course. What if, as an LIS professional, you’re asked to take a look at a library trend — e.g., makerspaces, information commons, artist-in-residence, knowledge center, civic engagement — when no similar initiatives currently exist at your library, in your community, or even in your region? Too often such trends are offered as packaged products that can be dropped into place. But how can we know if the community is ready for some or all of the components of such a trend? Are stakeholders informed and aligned regarding design and implementation of a trend? What leadership roles are available in the process of developing, championing, and implementing the trend? What adaptations need to be made to fit the historical and existing social ecology of the community and the library? What work needs to be done to secure approvals given the specific forms of municipal, city, school, board, director, administration governance of the library? What parts of the trend fit within, or conflict with, the strategic plan of the library? What policies might need to be reviewed and revised to support implementation? Using a CAOS heuristic to consider the Cultural, Administrative, Organizational, and Social dimensions affecting work within the organization and with community stakeholders, this course will help prepare students to engage as change agents and leaders. Students will work in teams to prepare a plan of action to implement the CAOS heuristic for one or more case studies — class participants are encouraged to propose a case study from their own field experiences as a focus for a project team. Two- and four-credit hour students (LIS490ST2 and LIS490STG, respectively) will work together in teams and jointly present their plan of action; four-credit students will be tasked with creating final written documentation of the plan of action. While this course is offered through the Graduate School of Library and Information Science, we seek graduate students from multiple disciplines, such as education, social work, human and community development, gender & women’s studies, African-American studies, informatics, etc. On-campus students traveling during the summer can elect to join class online as needed. Pre- and Co-requisites: Consent of instructor for non-LIS graduate students. Readings, class discussions, and pre-recorded lectures may be used to provide students with background knowledge and information related to the case for the semester to inform creation of an initial plan. However, the majority of the class is used to primarily emphasize “learning through doing”, with class time being dedicated to peer support and instructor mentoring to inform project development. Using a Critical Friends approach, critiques will be incorporated into class meetings at regular intervals throughout the semester. Some of these will be informal or “desk critiques” while others will be more formal presentations of progress, culminating in the final presentation of project(s) and critique on the last day of class. Project work will be posted on appropriate course-related sites throughout the semester. Professional Journal (40% of grade): Each week students should spend about an hour writing down their reflections on the in-class discussions and in-field experiences from the past week. These will be posted to the Professional Journal forum. Students should also periodically comment on the reflections of other students to affirm and expand upon lessons learned. In all posts, students will be expected to develop their capacity to bring into dialog: 1) personal histories, field experiences and knowledge; 2) the insights of authors from this and other classes; and 3) lessons learned from in-field professionals and community members. Overall, in lieu of more classroom contact hours, students will be expected to use professional journal entries and open discussion forum to extend dialog on in-field experiences, readings, and project ideas as a form of field notes and collaborative offline discussion. 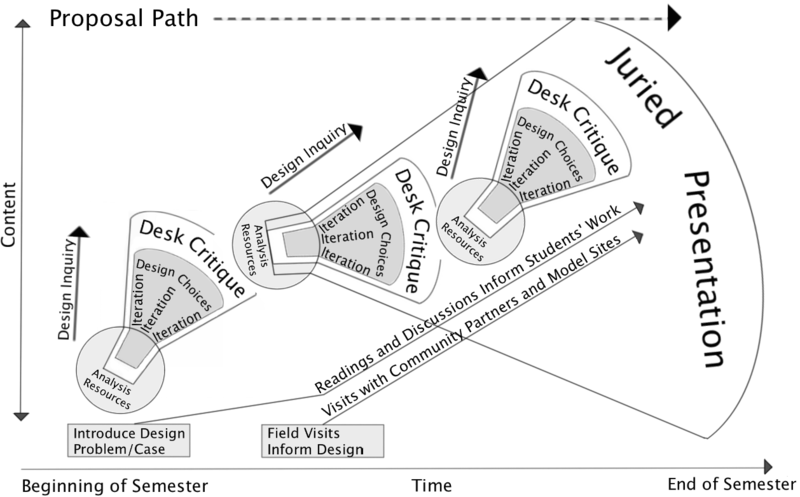 Development and Presentation of a Plan of Action (50% of grade): Students will work in teams to apply the CAOS (Cultural, Administrative, Organizational, and Social) heuristic fora case study — class participants are encouraged to propose a case study from their own field experiences as a focus for a project team. Two- and four-credit hour students (LIS490ST2 and LIS490STG, respectively) will work together in teams and jointly present their plan of action; four-credit students will be tasked with creating final written documentation of the plan of action. This score will be prorated according to credit hours. Class time will be used to learn about different aspects of the heuristic, to report back on progress, to participate in critical friends feedback sessions, and to collaborate as a community of practice. Most of the project work will require outside class time to accomplish.